Since the beginning of 20th century, many tire manufacturers made several attempts to develop non-pneumatic tires (NPT) based on elastomers and innovative tire designs that could provide same mechanical properties as of conventional tires. First non-pneumatic tire were used in early 1970's by NASA in its Lunar Roving Vehicle. Concept of non-pneumatic tires was introduced to overcome the limitations of pneumatic tires (PT) such as dependency on air. However, being in its nascent stage of development the NPT designs suffered disturbing issues that prevented this technology from being widely adopted. Many companies have successfully developed the range of non-pneumatic tires that would eliminate the hazards of conventional tires and at the same time, will be competitive with few models of non-pneumatic tires. For instance, many companies such as Bridgestone, Hankook and Michelin have introduced their non-pneumatic tires with the aim of mass production n nearby future for defense as well as civilian sector. Few off-road vehicle manufacturers company also introduced their new off-road vehicle models equipped with non-pneumatic tires. Off-road vehicle manufacturer Polaris has introduced their new Sportsman WV850, a military grade all terrain vehicle (ATV), outfitted with the non-pneumatic tires. Advantages of non-pneumatic tires that allow the users to not worry about air leaks or flat tires, for most drivers this feature sound revolutionary, which significantly aid the significant adoption of non-pneumatic tires in coming years. Currently most the NPT manufacturers are focusing low-speed applications, such as construction and Low-speed electric vehicles. Non-pneumatic tires are perfect for such use as high-speed vibration problems won't come into action and the ruggedness of the NPT will provide advantage at construction sites and rough terrains. 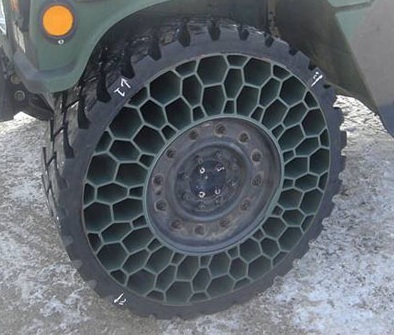 Additionally, various military forces are aiming for the implementation of these tires in military vehicles that will provide the advantage in combat field by eliminating the maintenance of conventional tires. For instance, Polaris a leading manufacturer of ATVs and military grade vehicles has started delivering its MV850 ATV with non-pneumatic tires to the U.S special operation forces and planning to introduce a retail version too. Non-pneumatic tires are highly capable of providing advantages over conventional tires in various industries, which is expected to bolster the demand for non-pneumatic tires in nearby future. However, this technology is still in its nascent stage and will take more time and developments to hit mass market. Non-pneumatic tire have high rolling resistance and less suspension than similarly sized pneumatic tires. Moreover, other challenges including dissipating heat buildup that occurs when they are driven restrict its usage in low speed vehicles only. But these challenges won't stop the manufacturers to stop investing in R&D of these new tires and this advanced technology is likely to hit the pavement in nearby future. The global non-pneumatic tires market is anticipated to expand at compound annual growth rate of 11.0% over the forecast period i.e. 2016-2024. Further the market is expected to capture 3% to 4% market of global tires market owing to its wide application in low speed electric vehicles, off-road vehicles and military grade vehicles. Regionally, North America dominates the global non-pneumatic tires market owing to the significant demand of ATVs equipped with non-pneumatic tires in U.S army. Innovation and high R&D investments by regional tire manufacturers to implement these tires in various other vehicles are expected to bolster the demand for NPT in coming years. Other regional of global non-pneumatic tires are Europe and Asia Pacific which are anticipated to witness significant rise in adoption of these tires owing to the presence of big vehicle and tire manufacturers in these regions and rapid adoption of new automotive technologies.